OMG, I totally had a lunch box like that. And yep, the thermos too! This is such a pretty polish. I have yet to get a rainbow glitter polish with the chunky glitters. 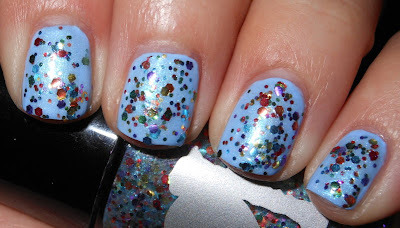 Well, except ULTA Pinada Yada Yada, but I get like 2 pieces of glitter per nail:( I'm going to check out the site now! i'm so glad i picked this up today, i love it in the matte state! I used to love My Little Pony! I love this color too - so much sparkle! 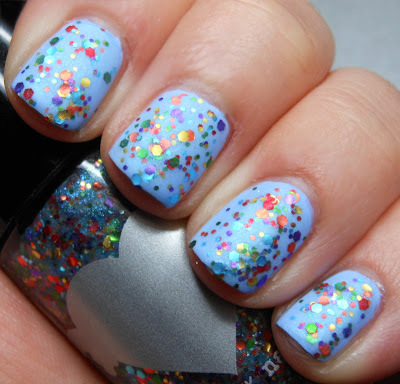 This polish is so cute!! I also LOVE your new banner! I would so buy that lunchbox and rock it with my mani if I were you! Love, love, love this color and it looks way amazing over that Essie. My favorite My Little Pony that I had when I was little was one of the fuzzy velvet ones. It was white with neon green hair. I can't remember the name but I loved her. That and the little baby seahorses. Oh, childhood. So awesome! It's totally appropriate :) I say get it. Eeek, I'm wearing this now as accent nails. Your blue choice of undies is better than mine! I can't wait to wear this as a full mani. And wow does it look awesome mattified! The matte version looks better! So cute! 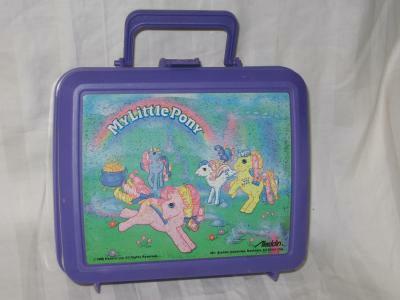 I don't know that it matters that people might look at you in a strange way if you carry around a My Little Pony lunchbox. I don't stare people down when they wear crocs.... well, yes I do but that's different. This is very pretty! Love it over the light blue! I think I would carry around that lunchbox too if I had it, and I am 24!